Shark Tank startup, ilumi, continues to grow its national retail network and is excited to announce that ilumi Smartbulbs can be purchased in all Best Buy locations in the United States. With the launch of its new BR30 LED color tunable outdoor floodlight, ilumi now offers three unique products on all Best Buy store shelves. 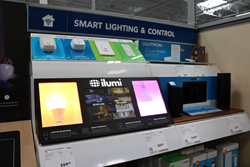 Find ilumi on the shelves at BestBuy in the Smart Lighting & Control section. With its exclusive Bluetooth MeshTek technology, the ilumi Smartbulbs enable Best Buy customers to install and control their new bulbs in seconds, transforming their environments with a simple smartphone app without expensive hubs or other hardware. The combined store and product line has expanded ilumi's retail distribution channel to grow to over 1200 locations in North America, cementing its position as one of the fastest growing lighting companies. With its exclusive Bluetooth MeshTek technology, the ilumi Smartbulbs enable Best Buy customers to install and control their new bulbs in seconds, transforming their environments with a simple smartphone app without expensive hubs or other hardware. "Best Buy and ilumi are a perfect fit for driving growth in the connected home category. The combination of advanced features such as music sync as well as a simple installation and setup make it easy for the Best Buy Blue Shirts to feel confident recommending our products," said Corey Egan, Co-Founder, ilumi. "Both our companies have focused on delivering a compelling retail experience and made it easier for customers to live more connected lives." To find the Best Buy store nearest you, visit BestBuy.com. To check out ilumi offerings, visit http://www.ilumi.co. ilumi solutions, inc. transforms ordinary things into extraordinary experiences, beginning with light. The company first launched the ilumi Smartbulb in 2014 after collecting more than $200,000 via crowdfunding and a $350,000 investment from billionaire Mark Cuban through an appearance on Shark Tank. Based out of Dallas, Texas, the company holds six issued patents and multiple patents pending covering a wide variety of smart lighting, advanced wireless networks and other unique technologies and was recently named one of Entrepreneur Magazine’s top 100 most brilliant companies of 2015.